Our skin is the largest organ of our body. It is an external organ that we wear and people see it from the outside, which gives us all the more reason to take care of it. Skin problems are normal and for me, they vary from manageable to beyond manageable — wherein I seek the help of experienced skin professionals. It was around 2007-2008 when I experienced breakouts and I didn’t know what to do. My friend Cath introduced me to his doctor friend, Dr. J. Waltenspiel. He is a graduate from De La Salle Medical and Health Sciences Institute and was trained in Dermatology Institute Foundation of the Philippines. He was just starting out and rented a 2-storey house in Dian Street in Makati and turned it into a clinic. I found his treatment very effective and I was so happy with the results. Come 2009, he moved his clinic to a better area in Calatagan Street in Makati and named it to “Skinovative Clinic” by J. Waltenspiel.” In 2013, he established another branch in Dasmariñas, Cavite. Both clinics are specialized in Aesthetic Dermatology and are still open for business. I also tried other derm clinics especially those in the malls because they are mostly accessible (I live in Valenzuela) and none of those were effective. For 5 years, I also stayed and worked in Singapore and went to different skin clinics for my constant need for skin treatment (because I was exposed to sun 8 hours a day); but none of them helped me solve my skin problems, plus the services are very expensive. See my blog post on facial services in Singapore. So everytime I go for a vacation in the Philippines, I always make sure that I make an appointment with Doc J. His clinic has the most professional aesthetic feel and skin treatments anyone would ever need. His staff are amazing and the clinic’s services are really a value for money. I finally was able to drop by Hair Secret again to buy their organic hair color and try their Hair TCM – Traditional Chinese Medicine. Though there are clinics here in Philippines offering this kind of scalp treatment, this is still unknown for a lot of people with scalp problems. Hair Secret’s TCM is very simple compared to those I’ve tried in Singapore. First, the hair attendant applied rice wine on my scalp and massaged it in. Then, the TCM was applied to my hair and scalp. A hair spa steam machine was also used so that my hair could absorb the treatment better. After an hour, the TCM was rinsed off from my hair and scalp with an organic shampoo and conditioner. The hair attendant reminded me that shampoo and conditioner should be diluted in water before application to make them more gentle to the scalp. Lastly, my hair was blow dried with a warm temperature to avoid any scalp or hair damage. My hair became easier to comb after the treatment. My scalp felt clean, and my hair felt naturally smooth, soft and lustrous. This treatment is recommended for people with thin, balding hair, and they even got feedback that some of their clients’ gray hairs became darker. It is 100% organic and good for anyone. We have to be careful about taking care of ourselves. We should remember that beautiful hair starts from a healthy scalp. Hereditary premature graying hair has been my problem since I was 16 years old. So, as soon as I reached college, I started coloring my hair to cover the gray hair. And as my hair grows fast, I regularly do it every 4-6 weeks. Now, I am 18 weeks pregnant and this problem of mine got bigger because, as we all know, hair colors are made with a lot of chemicals. Even those hair colors from natural product stores still have a minimum amount of ammonia. Luckily, I found the Beauty Secrets Clinic over the internet. This clinic, like its name implies, offers the secret for healthy beautiful skin and hair, whatever your health condition is. Their hair color is made from organic ingredients and is chemical-free. Ms. Jinnie Uy, owner and director of Beauty Secrets clinic, is a health advocate. 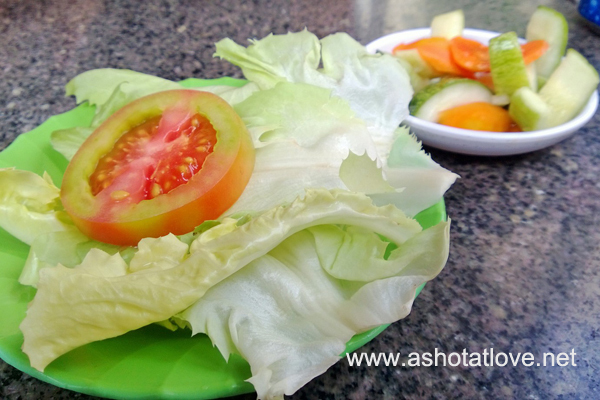 She strongly believes that “prevention is better than cure” and we are what we eat. The chemicals in the products that we use and eat destroy our healthy cells, thus causing sickness like cancer over time. The hair color (Radico Colour Me) looks and smells organic. It covers virgin hair easily, but if you’ve been doing hair color or other salon treatments before, the first dose of hair color will not cover the hair entirely as it will neutralize the chemicals you still have in your hair. You have to come back after a couple of days for another round. Beauty Secrets Clinic has a section for Hair Secret Organic Clinic which offers hair services. The organic hair color costs P2,500 and above, depending on your hair length. You can also buy their hair color product which is on promotion at the moment — a box weighing 100 grams costs P3,500, which is normally P5,000. It will be good for 2-3 uses depending on your hair length. Radico Colour Me didn’t stain my skin and towel after my bath as well. It is neither itchy nor harsh in the scalp. Though the dye tones are limited, it is 100% safe. It solves the hair dye problems of pregnant women like me, and even cancer patients and survivors. 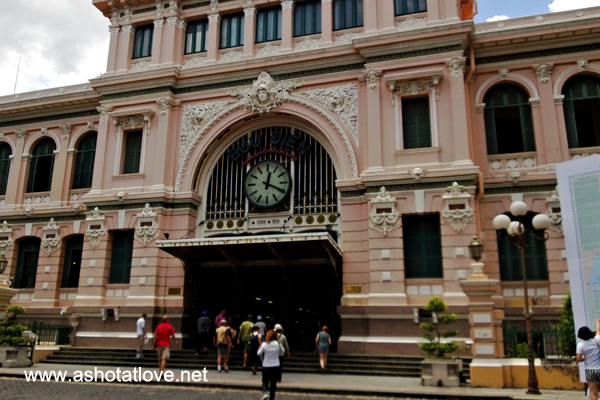 After postponing my travel to Ho Chi Minh for several times, I was able to have a very quick vacation to visit Jane. It’s my second time in Ho Chi Minh city and this travel is very different from the first one; simply because It’s experiencing a Vietnamese life for two days. From Tan Son Nhat International Airport, Jane fetched me, we left my stuff in her house and met her family then went for breakfast. 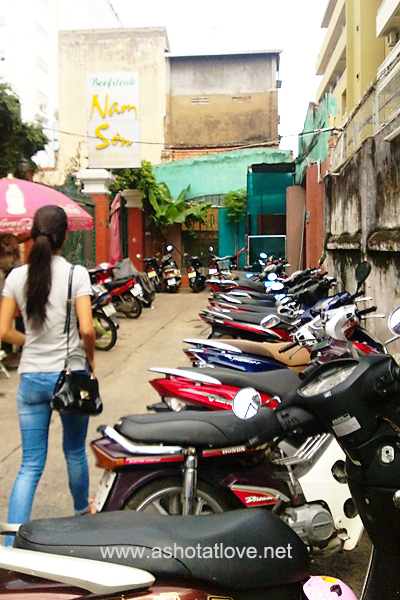 As planned, we tour the city by means of motorbike – the most common transportation IN Vietnam. We started the day with a lovely breakfast at Nam Son Beefsteak. 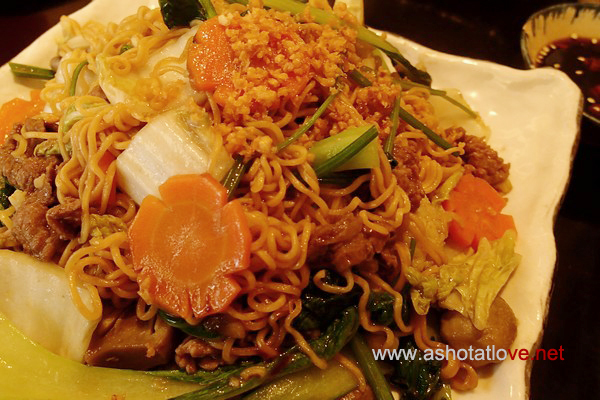 This restaurant is known for traditional Australian beefsteak dishes in Asian flavour. 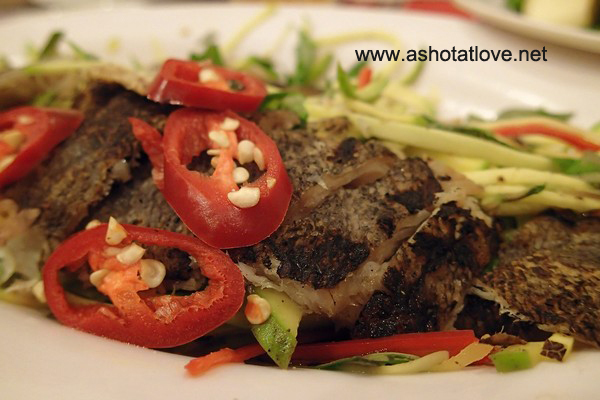 Their food is a fusion of Vietnamese and Australian gastronomy. 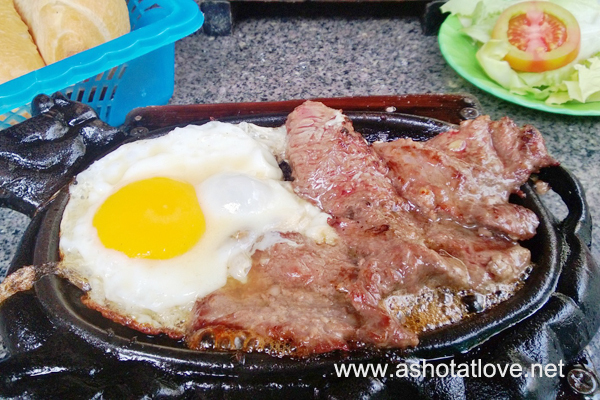 We ordered the Vietnamese beefsteak combined with sunny side up which is only 55,000đ. I love the steak, the taste is more into western side but is served with lettuce and tomato, carrot and cucumber in vinegar and Vietnamese baguette on the side. 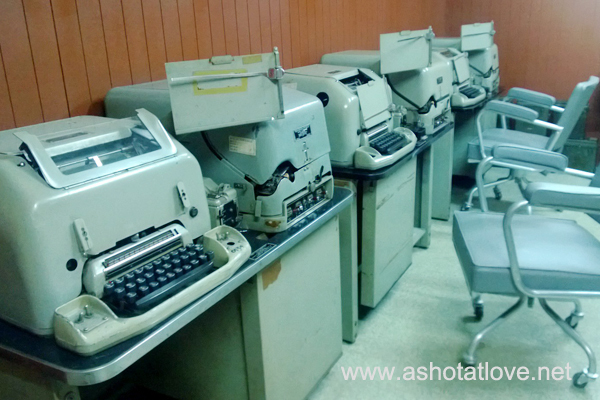 After breakfast, we started touring around, we went to Reunification Palace. 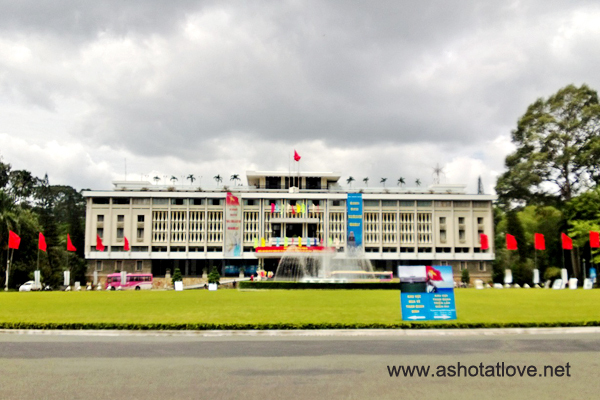 It is known before as Independence Palace and is the main landmark in Ho Chi Minh City. From the name itself, you can tell that this place is very historic. It is the home of President of South Vietnam during Vietnam War and was the site of the end of the Vietnam War during the Fall of Saigon. There are tour guides available wearing Ao Dai – vietnam’s national dress for woman. They also have media/visual rooms in allocated for different languages wherein you can watch the history of Vietnam. 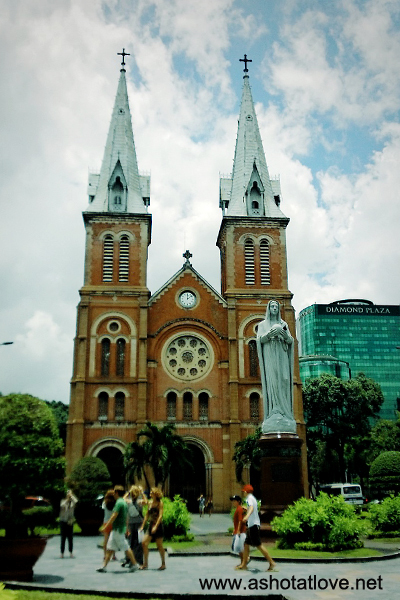 Next stop was Saigon Notre-Dame Basilica. I’ve been here before but was not able to capture a photo of this church with no people in the background and the second time around was the same story. Tourists are everywhere, unlucky me. 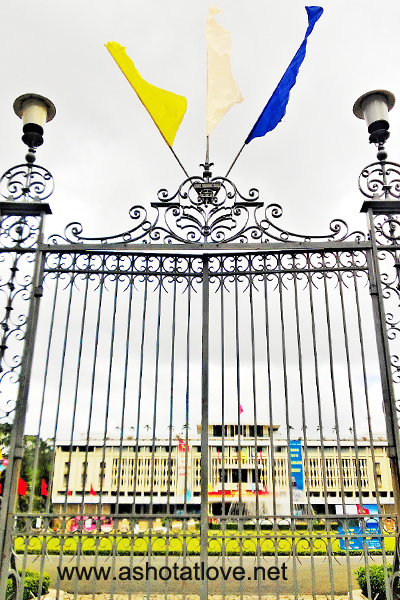 Adjacent to the Basilica is the Saigon Post Office; both establishments were built when Vietnam was part of French Indochina during 20th century. I like the Post Office’s neoclassical style of architecture and how the structure complements the surroundings. 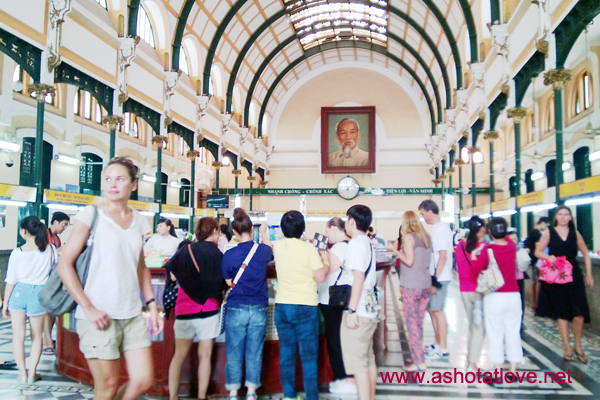 It is one of the known tourist places in the city, the reason why there’s a lot of souvenir shops inside the building as there are vendors outside. 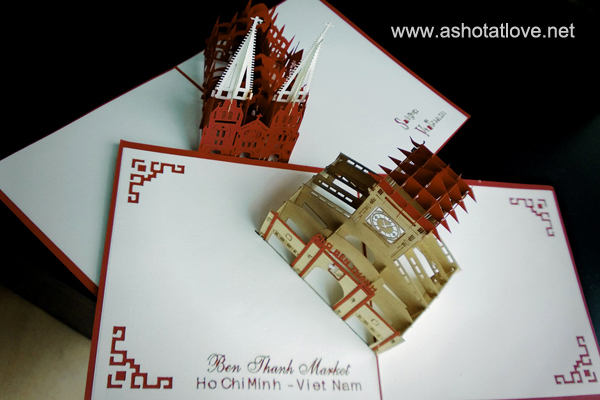 I bought these 3D greeting cards from a street vendor for only 50,000d. We went back to Jane’s place after for a late lunch. Her sister cooked some Vietnamese food. 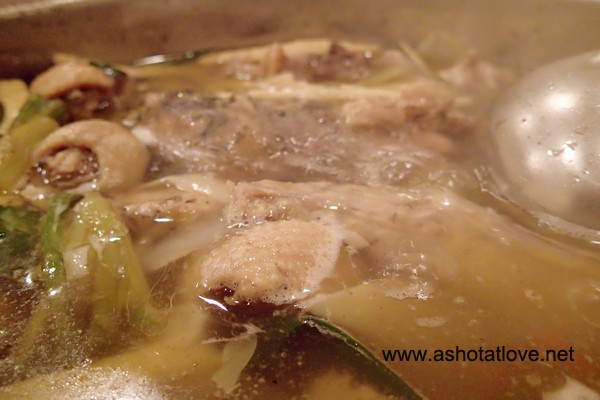 Vietnamese cuisine is one of the healthiest cuisine in the world. I remember how amazed I was on my first visit seeing that even rice with viand sold in the streets are served with star shaped carrots, cucumber or other vegetables on the side. After late lunch, we went to visit Jane’s friend who owns a salon. Wellness in Vietnam is cheap, the quality of services is good and they use products that are natural. I went for a manicure and pedicure. They don’t use cuticle remover – nail softening substance on my nails, instead they just soaked my fingers in water. Jane also convinced me to straighten my hair and do a treatment which I don’t know what is called as they can’t explain it in English. I was so scared because I’ve been doing nothing to my hair to make the scalp healthy again. I am not a fan of unnaturally straight hair but it’s done, I paid 350,000d for the whole services. It couldn’t be that cheap if they were not Jane’s friends. Anyway, the thing that I enjoyed while my hair is being treated is the treat of Vietnamese Ice Coffee. It’s the best coffee, even coffee in the streets are awesome. 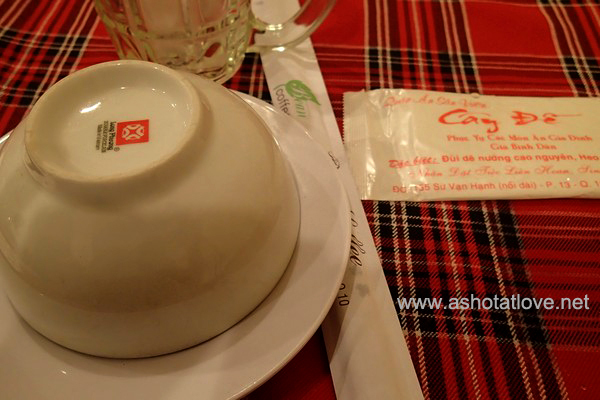 Jane also made me try a taho like snack, Vietnam’s version is with ginger. At night, Jane tagged me along to her friend’s birthday party. 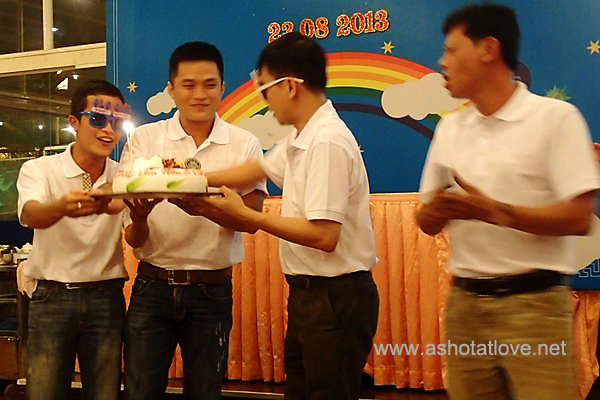 It was in Cafe Hoa Hồng, they have big rooms with videoke to accommodate birthday parties. Vietnamese people also love to sing. Though there are a few songs in English in their videoke machine, these songs are not updated in the song book. 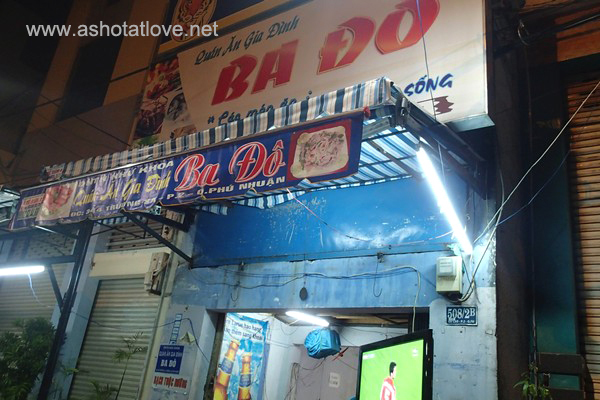 When Cafe Hoa Hồng closed, everyone drove their motorbikes to Cây Đề 155. 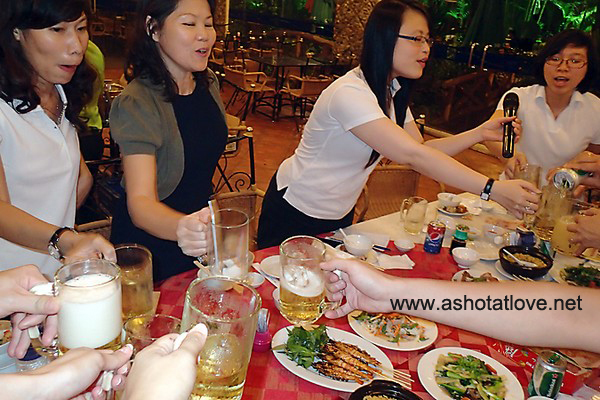 A place smaller than Cafe Hoa Hồng ; also with rooms equipped with long tables for group of people who want to drink or dine privately. It was interesting to see some traditional Vietnamese food like lẩu măng vịt (duck hotpot), gỏi cá sặc (dry fish salad), bánh tráng (rice paper), and pigeon pod rice. 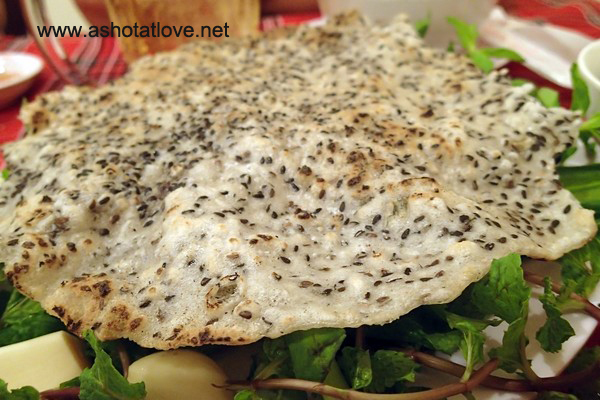 I tried the dry fish salad and rice paper, not bad. 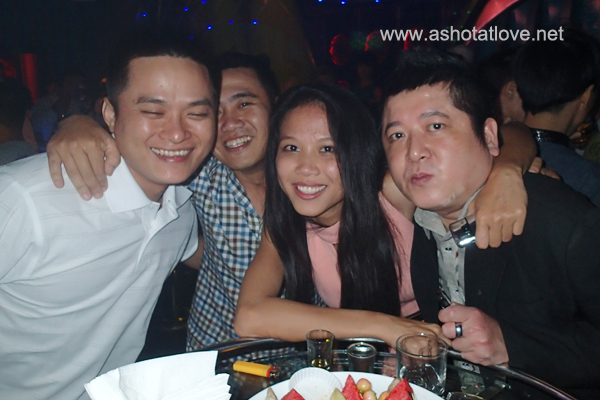 The birthday party ended after a few song games and drinks, finally we were able to meet her other group of friends. We went to Pham Ngu Lao Street, a place very familiar to me as the hotel where I and my friends stayed before is somewhere nearby. 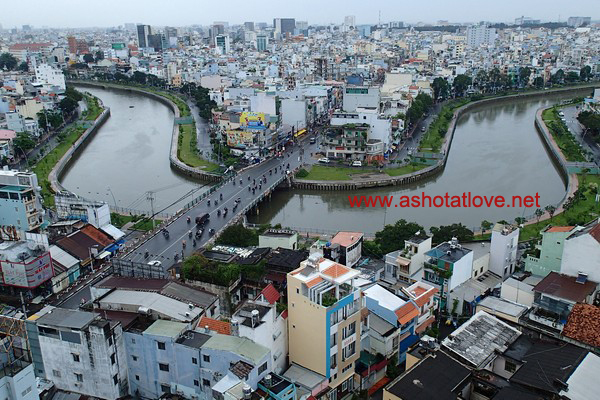 There are a lot of foreigners in this place as this is the backpacker district of Saigon. Indoor and outdoor markets are everywhere selling DVDs, clothes and souvenirs. 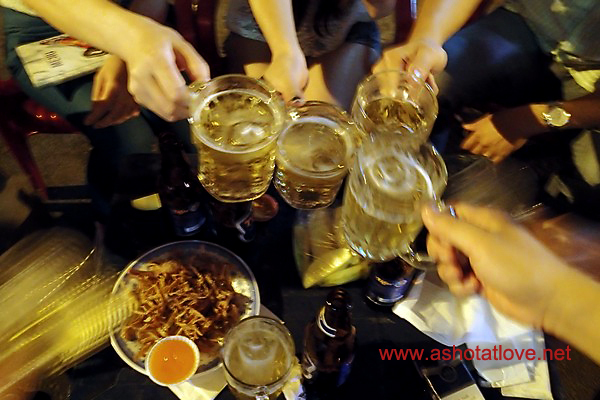 Bars and cafes in this district are conveniently located near central of the city. 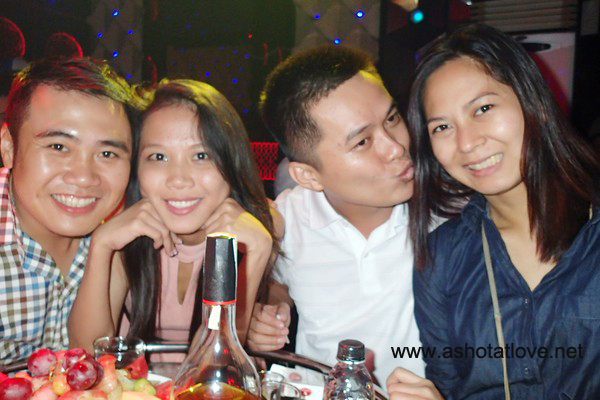 Before the bar closed and when her friends called it a day, Điệp asked me ‘Do you want to go to club?’ ‘They play Viet House music’, Mập added.’ I believe its after midnight already and it was just the start of the night for Jane and two other friends. Viet House music sounds interesting. ‘Why not?’, I answered. So we went to Club 35, people do drink and drive here like in Philippines by the way. Club 35 is crowded; well it’s Saturday passed midnight. I can tell Jane and friends are regular guests here because they still have a bottle of VSOP Cognac and there’s a reserved VIP table for us. We had bottled waters for chaser and a fruit platter to eat along with our Cognac. And I was surprised to see that fruit platter is the common food here to go with liquors. A small stage is in the centre of VIP tables where a DJ plays Viet House Music. Not bad, their music is danceable. We left as soon as we finished the Cognac. I can’t believe I’m still awake or half-awake, I also didn’t sleep much the night before the flight. I told them that we should take a cab because I won’t ride a motorbike going to Jane’s house with their condition, hehehe. So we took a cab and all along I thought we are finally going home until Jane told the cab driver to drop us off at the nearby café in her place. The café’s name is Bado. 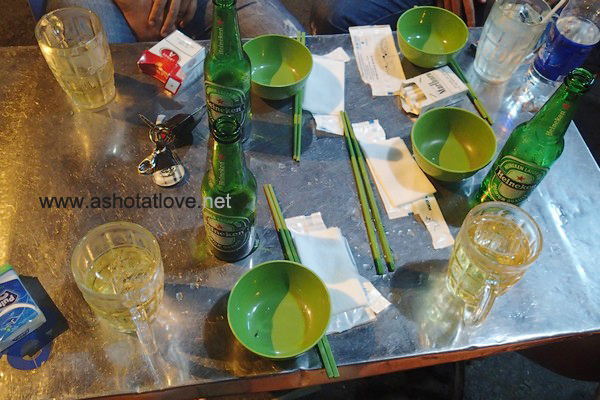 It’s a usual Vietnames café style wherein low tables and chairs are outside. I was so sleepy! I had a hard time staying up, ahehehe. I just took a few sips of my beer but when I tried the Stir fried bee hoon that they ordered it made me awake enough to eat some more. It’s the best Vietname food I’ve ever tried; it’s almost the same as Pansit Bihon in Philippines but better. My eyes are closing and Điệp was feeling awful that they decided to finally go home. Yey! I didn’t bring my phone so I really have no idea what time it was then but I swear the sky is getting bright already from Jane’s window. Harry, Jane’s ultimately cute 8 month old nephew woke me up in the morning but I still was able to sleep until afternoon. 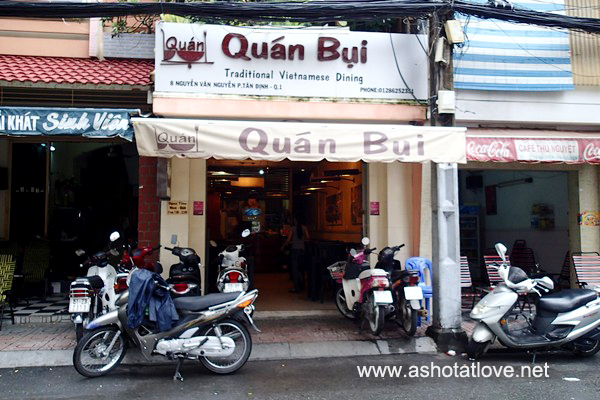 We had a quick traditional Vietnamese lunch at Quan Bin which is just opposite Jane’s place. The food is good; the serving is a bit big. I had a stir fried Vietnamese noodles, wherein I think there are more vegetables than the noodles while Jane ate seafood spaghetti. They also serve fresh fruit shake with hair strand; exotic drink? Big No! This time around I was able to buy a Northface backpack for only 550,000d. A Vietnamese instant coffee, a kilo of ground coffee and some French drip filters for 650,000d and a shirt saying ‘iPho’ to wear. My quick vacation won’t be complete if we didn’t go for massage. 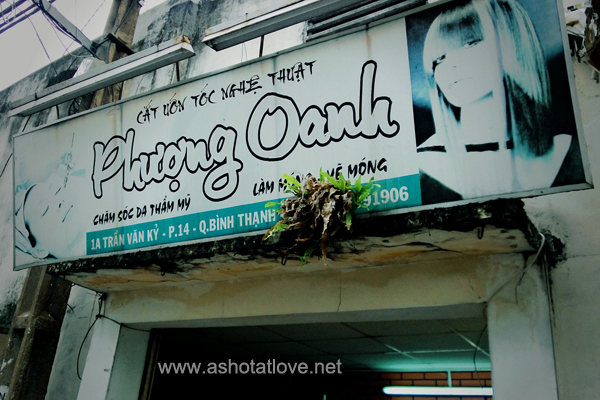 We went to Quynh Nhu foot massage salon at 137 and 115 Ham Nghi Street, district 1 for a whole body massage. It is just a few walk away from Ben Than Market. The session lasts for 90 mins, complete with facial and scalp massage, herbal foot soak and wash, facial mask, hand/arm, shoulder, back/bottom massage, pressure points (reflexology), walk on the back and ends with a serving of dried ginger in sugar and hot tea which is awesome. It was already 7pm when the massage was finished. We hurriedly went back to her place for a quick shower then fetch a cab to catch my flight at 9:45pm. No time for dinner so I just ate in the plane. It was indeed a very short visit but is something different from my usual travels. And if I have would have the chance to visit Jane again, I surely will.